Over the space of many vintages in The Cape, Syrah has proven itself well suited to the soils and the climate of our beloved Helderberg. With our vines maturing nicely we are seeing wines of elegance, depth and restraint, while also allowing the unique aspects of the terroir to shine. 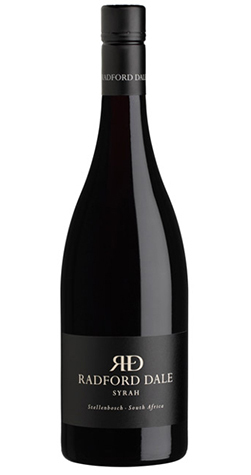 With the 2013 vintage we have reached a new level of sophistication with this, our flagship Syrah. The wine shows a fantastically enticing nose with oriental spice notes and dark fruit complexity. Fine black pepper and soy sauce notes over a dark fruit core form the focal point of the palate while the grainy texture of adds grip before a lovely fresh finish. Both vineyards that produce this exceptional Syrah are planted on soils derived from granite. The older of the two vineyards (now 24 years old) is rooted in a particularly rocky variety of decomposed granite known locally as “Koffie Klip”. The second is on a crunchy, less decomposed granite. This imparts to the wine an elegant and refined character while the temperate Summers of Stellenbosch allow the grapes to ripen slowly and evenly, allowing for depth of flavour and great balance. The winter that preceded the 2013 harvest was rather dry but very cold, this meant even budding and slow but steady growth of the canopies. During the ripening period nights were quite cool as opposed to the high day time temperatures experienced during January 2014. This meant that the frui tripened with much intensity and concentration. Grapes were picked by hand in the cool of the morning and then hand sorted with particular focus on excluding any raisins or berries which had seen too much sun so that the natural purity of the fruit could be highlighted. From there the grapes were destemmed and lightly crushed and left to “cold soak” for three days at low temperatures. A small portion (20%) of the fruit was fermented as whole bunches in an open top fermenter. This process highlights the spiciness of the variety and brings delicate floral aromas to the final blend. Natural fermentation with no addition of yeast was employed so that the wine express the site and the vintage instead of having a predetermined set aromas and flavours. The wine was pressed soon after the fermentation was completed and transferred to barrel. Malolactic fermentation took place in barrel. Barrel matured for about 19 months, then assembled into one tank, which was settled in our cold cellar for almost 2 months before bottling. No fining and bottled without filtration. The Winery of Good Hope was founded in 1998. We believe in combining innovation with a healthy respect for tradition. In other words, our approach is old plus new, and the best of both worlds. We specialise in the mountainous viticultural sub-regions of the Helderberg area in Stellenbosch,Elgin, and the Perderberg area in the Swartland. This is a fancy way of saying that we work with grapes from all of these areas – the right grapes for the right wines (rather than growing all the fruit on our property). That’s one of the reasons we’re different.